The InSinkErator HWT-F1000S Hot Water Tank and Water Filtration System is to be used in combination with InSinkErator Indulge Series water dispensers for filtered, near-boiling 200-degree F water instantly (water dispenser sold separately). With near-boiling water at your fingertips, you can enjoy the convenience of instantly preparing gourmet coffee and hot tea, steaming vegetables in a flash, warming baby bottles in seconds, removing candle wax from candle holders with ease, cleaning without the use of harsh chemicals, removing stubborn lids and labels, and so much more. 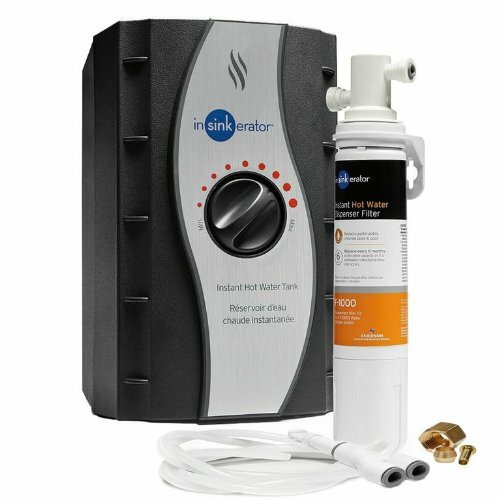 Featuring a compact design, the 750-watt instant hot water tank has been re-engineered for longer life and improved performance with a 2/3-gallon capacity, tool-free connections to ease installation, easy adjustable temperature control (160 to 210 degrees F), and dry-start protection for peace of mind. The F-1000S Water Filtration system is designed exclusively for use with InSinkErator water dispensing systems. It reduces particulates, chlorine taste and odor, allowing you to enjoy better-tasting hot beverages. It has a 1/4-inch quick-connect fitting and is replaced easily without contact with used filter material. It also allows for automatic water shut-off during filter cartridge replacement. The water filtration system is NSF standard 42 certified for quality assurance. InSinkErator covers the HWT-F1000S system with an exclusive 3-Year We Come To You In-Home Limited Warranty for the instant hot water tank, and a 1-year warranty for the water filtration system. This warranty includes free house calls (including parts and labor) for the entire warranty period.